I’ve now finished my first batch of marking (Astrophysics & Cosmology) and I now have a few days to do other things until the next (larger) set of scripts arrives from Vector Calculus and Fourier Series which takes place on Saturday. (You might want to click on the image to make it clearer.) You can find the live odds here. You will see that this is quite an active market – with over €700K being wagered. Odds of greater than 40 to 1 against a `yes’ vote but most of the action is on `no’. Note that quite a few punters are laying on this outcome, with odds of about 25-1 on. 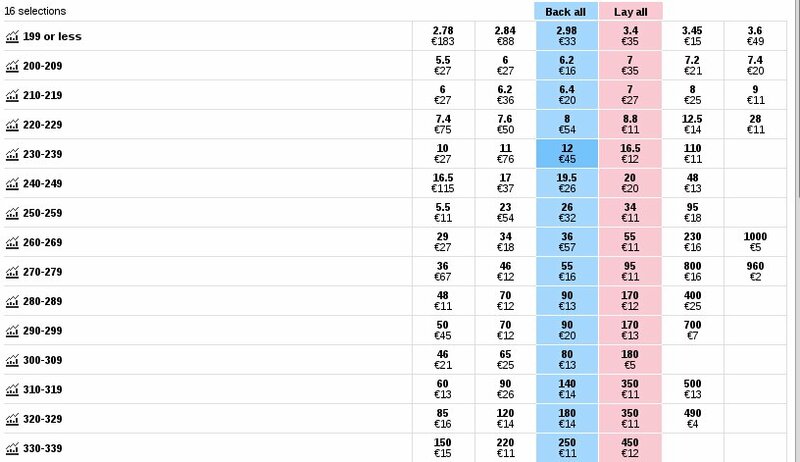 (The way odds are shown in the second row is that 1.04 means you with 4p for every £1 staked). The shortest odds are for the first option, i.e. for 199 or fewer voting with the Government, but there is activity across the whole range of possibilities. The press are talking about a defeat by 225 votes, but for what it’s worth I don’t think it will be such a large margin. I’m not going to bet on it, but I expect it to be defeated by less than 150 votes. UPDATE: Not for the first time I was wrong. The vote was Ayes 202 Noes 432, a majority of 230 against. That means there were no abstentions. Modified Gravity: Evidence from Cavendish Experiments? Recent experimental results for the gravitational constant G from Cavendish-type experiments were analysed in the framework of MOND (Modified Newtonian Dynamics). The basic assumption for the analysis is that MOND corrections apply only to the component of the gravitational field which leads to an accelerated motion of the pendulum body according to Newtons second law. The analysis is based on numerical solutions of the MOND corrected differential equation for a linear pendulum at small acceleration magnitudes of the order of Milgroms fundamental acceleration parameter a0 = 10-10m s-2 for the case of a mixed gravitational and electromagnetic pendulum restoring force. The results from the pendulum simulations were employed to fit experimental data from recent Cavendish-type experiments with reported discrepancies between G values determined by different measurement methods for a similar experimental setup, namely time of swing, angular acceleration feedback, electrostatic servo and static deflection methods. The analysis revealed that the reported discrepancies can be explained by MOND corrections with one single fit parameter. The MOND corrected results were found to be consistent with a value of G = 6.6742 x 10-11 m3 kg-1 s-2 within a standard deviation of 14 ppm. I have edited the abstract slightly for formatting and added the link to an explanation of MOND. You can find a PDF of the paper here. The claim that Modified Newtonian Dynamics can resolve these `discrepancies’ is very bold and I’m very skeptical of the arguments presented in this paper. It seems to me far more likely that the divergence in experimental measurements is due to systematics. If anyone else has different views, however, please feel free to share them through the comments box.